James Songster joined the Walt Disney World Co. in 1992 and in 2014 received the prestigious Disney Legacy Award, one of the highest recognitions presented by The Walt Disney Co. As a professional Speaker and Workshop Facilitator, James has helped thousands of Disney Cast Members, groups and organizations by leading development programs on Disney heritage and operating philosophies, such as Disney's Leadership Stategies, Techiques of Teamwork, Creativity, and Approach to Organizational Excellence. 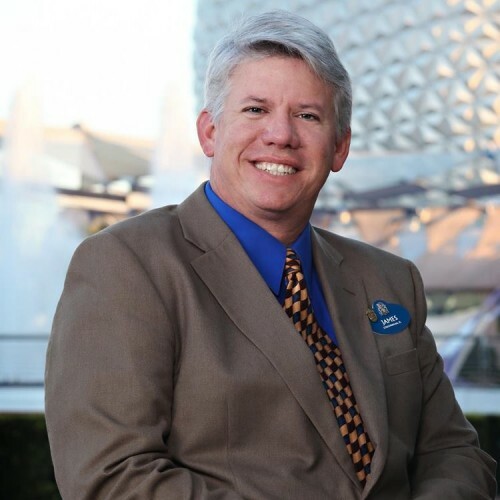 James was selected by Disney's Education Programs to help develop and implement Disney's highly acclaimed Leadership Strategies and Techniques of Teamwork programs for university and college-level participants. He has continued in his role as the Trainer of Facilitators for these programs. Outside of Disney, James is a Professional Magician in Orlando, performing his award-winning resident show, Magic and Mayhem, at the Sheraton Vistana Resort, now in it's 8th year. The show has twice been voted "Best Dinner Show in Orlando" by voters of the Orlando A-list Awards. James is the Owner and Director of Talent for It's Unbelievable Magic and is a member of the International Brotherhood of Magicians as well as the Society of American Magicians. He has won multiple performance awards, both domestically and internationally. Find out more about James Songster at http://www.SeminarMagic.com.